Add the cost of dentures to Schedule A. 1. Can Your Therapy Sessions Be Tax Deducted? 2. Is Professional Counseling a Tax Deduction? The Internal Revenue Service permits you to deduct certain dental expenses from your income, thus reducing your taxable earnings. As of 2012, you may write off approved expenses exceeding 7.5 percent of your annual gross income. In 2013, the tax code raises that cap to medical expenditures over 10 percent of your gross pay. Dentures are among the deductible medical expenses. The gross income you declare on Form 1040 is automatically decreased at a minimum by a standard deduction the IRS establishes for the different classes of taxpayers. You may possibly reduce your tax liability even more if you itemize qualified expenses as deductions on Form 1040, Schedule A, and they turn out to be higher than the standard deduction. You may itemize a variety of payments you made during the tax year on Schedule A, including qualified dental expenses. 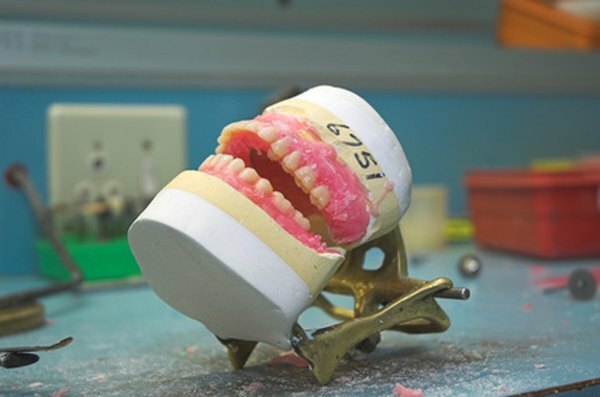 If the cost of your dentures does not exceed the percentage of your gross income specified by the IRS, then they do not give you a tax advantage. But as you will see, Schedule A also allows for other expenses, such as mortgage interest, charitable donations and health insurance premiums, to be deducted. Add all eligible payments you made during the year in Schedule A to get the total of your itemized deductions. Compare the figure with the IRS’ standard deduction to see which gives you the higher tax credit. It is important to note that the revenue agency allows you to claim your itemized deductions even when they are lower than the standard. Get a receipt from the dentist that shows who received your payment and that it was for dentures. In addition, the provider’s statement has to include the dates of the dental treatment and how much you paid. The IRS does not want you to file receipts with your tax returns, but the agency may ask you to submit them as proof of expense during an audit. Save your dental-care statements with your other tax documents in case you are asked to show evidence of payment. Note that if your dental insurance pays for any part of the dentures, you may only claim as a deduction the portion you paid out of pocket. Under the U.S. tax laws, the IRS usually has three to seven years to audit your return and ask that you prove your claims. Thus, a good practice is to save your supporting receipts for at least that long. Keep in mind that if the agency suspects fraud, the period for audits is extended indefinitely. You may save space by scanning your tax returns and related documents, and storing them electronically.